Moms, You Can Teach Your Kids to Study the Bible. But after mom has been studying the Bible on her own, it probably won't be long before she desires to involve her children and share the same life-giving words with them, teaching them a pattern for understanding scripture that lasts a lifetime. This type of teaching doesn't require an education degree, any special knowledge, or a deep passion for complex theology. All it requires is an ability to open the Bible, and share with your kids the scripture study method you're already using (in their language of course!). Which is why we've created these Kid's Abide Study Cards for you to bring your children alongside you in studying the Bible. 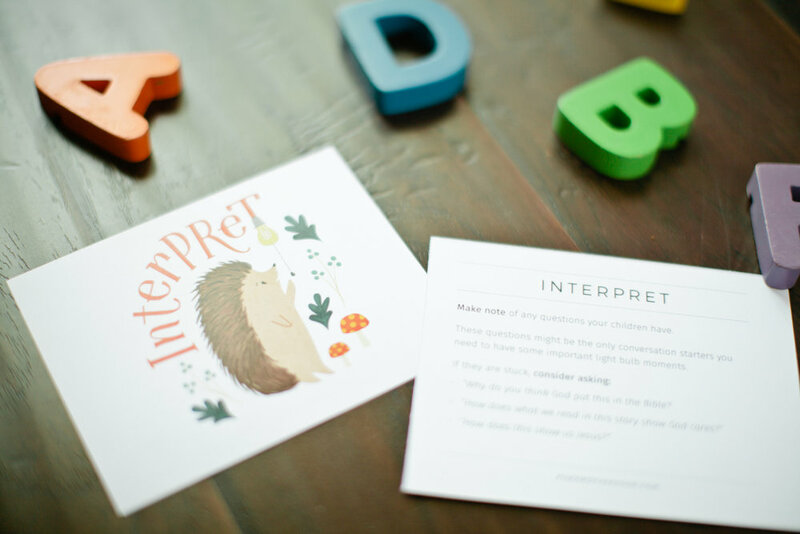 These cards, available in both English and Spanish, feature adorable woodland animals acting out four simple steps to studying God's word, that follow the same steps as our Abide method for adults: Read, Observe, Interpret, Apply. On the back of each card, we've added instructions for what each step entails, as well as offered simple prompts for engaging your children in discussion. Illustrated by the talented artist, Jess Blanchard, we pray these cards will be a blessing to your whole family. Pick a text to study with your children. Try to use scripture you or they are already learning so that you aren't making more work for yourself! For instance, you could talk about the same verses they are learning in Sunday School or a mid-week Bible program. You could discuss the passages of scripture that your pastor is working through on Sunday mornings. Or you could just talk to your kids about the text that you're currently studying and learning from! Again, whatever you choose - try to keep it simple so that the kids can see a logical connection between church and home study. Find a consistent time to sit down and talk about the scriptures. Every family is different! Some might have time to do this before or after breakfast. Some families might be able to discuss scripture on the way to or from school. Some might incorporate this into a homeschool routine or curriculum, and some might wait until right before bedtime! Whatever time it is, try to be consistent (at least 1-3 times a week) and don't get discouraged if you miss one or many weeks. Just keep coming back to this habit! Print off the free printable (in English or Spanish), cut out the cards, and gather necessary materials. This can be as simple or elaborate as you want, but you might consider having a Bible for each of your children to hold / explore, a notebook for them to draw pictures of what they are learning, and/or a special toy that they can play with while they listen. Keep all of these things together in a box or container, in a visible, easy-to-grab location. Talk to your kids about the Bible! Read the passage for the day. For young children, this might be a few verses at a time, up to a whole chapter. Use the instructions on the back of the card to help guide the discussion and keep you focused. The main idea is to model the study pattern for them everyday! After you read, spend some time making observations about what you read, asking questions about the passage (There are prompts on the cards to help you think of some), and finally, make application to their little lives. Remember momma: this WHOLE process might only take 10 minutes or less, and your kids might be squirming, interrupting, and might not seem to absorb anything. Take heart! Pray together. Close your time by praying through the scripture that you just read. Pray for the questions they had, and for the personal applications you came up with together. And most importantly, pray that your children would develop a deep, lifelong love for God's Word!! This method is meant to be SIMPLE. It should be an extension of what you're already doing. You're just bringing your kids alongside you, fulfilling the Great Commission as you make disciples of the little ones in your own home. You're teaching them to follow and obey God as you follow and obey him! Don't view this as another task on your to-do list, but an eternally rewarding responsibility that God has ordained for you in this season of life. It won't always be fun or easy, but it will sow seeds that (Lord willing) will reap a huge harvest as God provides spiritual growth in the lives of your children! **Please feel free to share this printable on your blog, website, or social media, but please link back to this page, rather than the PDF.